In late April, the Tufts University publication TuftsNow showcased the work of the neuroscientist Phil Haydon, an expert on “glial cells,” the most abundant element in the central nervous system. In the past, glial cells were regarded as mere packing material for neuron cells—the cells said to enable cognition. The TuftsNow article, written by Bruce Morgan, notes that it wasn’t until 2004 that the term “glia” had much relevance for researchers. “Alzheimer’s presents a special case,” Morgan writes, noting that a healthy brain has no trouble regulating the build-up of amyloid plaque. But for those of us who have the disease, the amyloid “overwhelms the brain’s regular maintenance systems with the result that protein fragments accumulate to form hard insoluble plaques.” Over time, cognition declines, with weakening short-term memory typically serving as the canary in the coal mine. In what Morgan describes as a seminal moment more than two decades ago, Haydon, then doing research at Iowa State University, succeeded in killing off the neurons. “He expected that the glia would fall silent along with the neurons,” Morgan writes. “Instead the glia kept emitting chemical signals…. The glia, Haydon was shocked to discover, were not as passive or inert” as researchers had presumed. At a conference, Haydon made the point that if he “stimulated the protein in question, it might help clear the excessive level of plaque found among people with Alzheimer’s.” Subsequent testing on mice was encouraging. A particular molecule—identified as GC21109—brought two benefits, according to Morgan. It sped up plaque removal from the brain’s surface and it decreased inflammation. Phase 1B proof-of-concept trials began in February of last year, involving people with mild or moderate degrees of Alzheimer’s, and the results were promising, Morgan wrote. “According to the usual biomarkers, patients with Alzheimer’s Disease saw rapid reversal of the amyloid cascade” [my italics]. This could lead to a very good thing, but getting through each stage of the regulatory review will take time, and Haydon estimates that the drug won’t be on the market until at least 2022. This raises a question, maybe a no-brainer question. Should I volunteer for the next round of clinical trials? I seem to meet the criteria. I’m still in the mild stage of Alzheimer’s, and, other than my preexisting disease, I’m in excellent health. And Tufts Medical Center is fairly close to where I live. Most importantly, if the trials are eventually successful, I would have a head start (assuming I have not been taking the placebo). My only reservation is this: Should I qualify for the trial, would I be able to handle the experimental drug’s potential side effects? I certainly hope so. In high school, I was an indifferent student, and when I read for pleasure it was usually Sports Illustrated or some other sports publication. That changed during my senior year when I encountered George Orwell’s famously bleak novel 1984, in which almost nothing is private and agents are always watching, watching, watching. Orwell’s message was blunt: The state, if it were ruthless enough, would go to any length—including into one’s bedroom—to root out dissidents and torture them in creative ways. In college, if one of my professors mentioned an important book—such as Upton Sinclair’s The Jungle, a fictionalized version of Sinclair’s muckraking reporting in early twentieth-century Chicago—I would make a note to read the book when I had time. I didn’t need much prodding. One summer I discovered Dostoyevsky’s Crime and Punishment, and a year later I dove into the 1400-page War and Peace. I happened to be house-sitting for one of my professors at the time, and I had limitless time to read. The deeper I got into the book, the more the fictional narrative seemed to blot out anything else I was doing. And it wasn’t just great novels that I wanted to read. I looked forward, as the new school year approached, to see which books my poli sci professors would assign. Yes, I enjoyed reading textbooks and marking the relevant passages with a yellow highlighter. By the end of college, I’d had enough of textbooks, and, after getting my first job as a newspaper reporter, in Connecticut, I began buying books frequently. My editor’s wife worked in a bookstore, and it was there that I purchased John Updike’s The Witches of Eastwick. It was not one of Updike’s best novels, but the book’s cover, designed by Updike himself, was gorgeous: within a scarlet frame was Albrecht Dürer’s etching of four full-bodied naked witches. I’ve never reread the book, but it conjures up a time when I was very ambitious and still very young. Not long after moving to Boston in the fall of 1985, my ambitions took a left turn. Forsaking journalism for fiction writing, I found myself two years later in grad school. I chafed at having time only for reading what was on the syllabus. When a Hemingway scholar intimated that he could get me into the Ph.D. program at Stanford, I declined his help. I’d had enough of reading from other people’s syllabuses. The reading I was doing wasn’t just pleasure reading, though most of the books I read I enjoyed. I drew on the formulation that reading was to writing as weight-training is to strength. Once I’d completed my master’s I was reading a new book almost every week. Of course, there was no great reason to keep that pace up, other than that I loved reading. 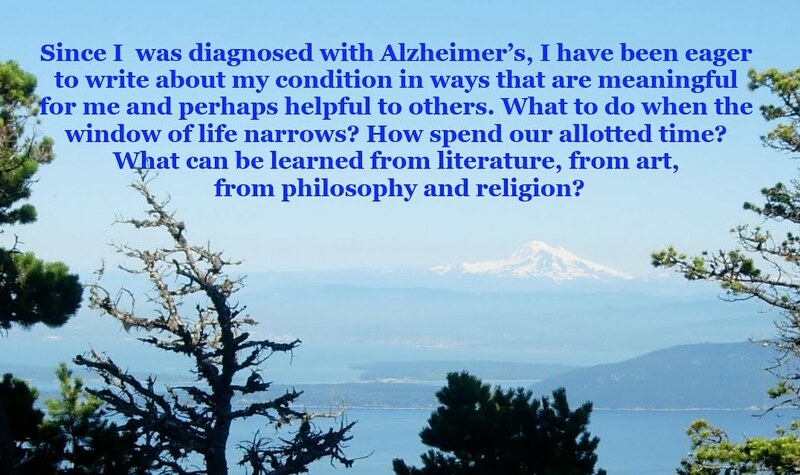 Has reading become more challenging since I started showing the symptoms of Alzheimer’s? Yes, when the text is particularly dense. Over the past week I’ve been reading a new biography of Martin Luther, written in an accessible fashion. If I had purchased the book, rather than borrowing it from the library, I would probably have done much underlining and annotating, to help me concentrate on the text. Fiction, because of its narrative pull, tends to be easier for me to read than nonfiction, though there are exceptions. When a friend of mine and I made a trip to Berlin and Prague last September, I brought along a translation of Franz Kafka’s unfinished novel The Castle. And that’s how the narrative ended, like a bridge project that ran out of funding. I am aware, of course, that there will likely come a time that my funding will run out as well. And that will be a very dark day for sure, akin, perhaps, to a form of blindness. Last week, Mike Belleville, one of the guys in my Alzheimer’s support group, and I told eerily similar stories involving Apple Stores, those gleaming technology palaces where all the employees wear matching shirts and none look older than twenty-five. While our circumstances were slightly different, we basically experienced the same frustration. In my case, after a period of growing irritation, I phoned Paula for help, and a few minutes later found what I was looking for. Mike, on the other hand, disclosed to his salesperson that he has Alzheimer’s. And, just like that, the salesperson became much more helpful. On Monday, Mike and I attended a conference on the “Dementia Friendly” movement, which originated in Britain and is now picking up momentum in the United States. As Olivia Mastry, the featured speaker at the event, noted, the approach is based partly on the Americans With Disabilities Act, the landmark legislation that became law in 1990. Mastry noted that her organization seeks to draw in not just people in health care but also those who work in related fields, such as municipal government, which coordinates assistance for military veterans, and providers of long-term care for people with dementia. And, perhaps most important, the people who are experiencing dementia themselves. Nationally, according to Mastry, the annual cost of dementia care is over $36 billion—and that doesn’t include the service supplied by family members. I heard one young woman who serves as caregiver for a parent lament that the parent’s care has created a heavy financial burden for the caregiver herself, in terms of lost income. In Minnesota, a statewide dementia-friendly plan was introduced in 2010 and now serves as a national model. It took two more years to work out the details. “The concept was to put in everything we know and organize it in a way that people could use it in a useful way,” Mastry said. “It’s researched, and evidence-based. We know that the best thing we can do is put all the best practices in one place. During the break for lunch, I encountered a former colleague of mine at the Massachusetts Municipal Association who is now the assistant town manager in the town of Westborough. We agreed that our former employer, the advocacy and professional organization on behalf of the state’s cities and towns, would be well-suited to champion this cause. To learn more about Dementia-friendly communities, go to dfamerica.org. Anyone who has taken a survey course in English literature is probably familiar with Lilliputians and Brobdingnagians, the races of midgets and giants that Jonathan Swift created in Gulliver’s Travels almost three centuries ago. Both names have become adjectives, and it is easy to discern, just by each word’s sound, which are the giants and which are the midgets. But in his satire, Swift also invented less familiar beings, including wise horses called Houyhnhnms and a race of immortals called Struldbruggs. Gulliver extolls the virtues of the Struldbruggs, who, through a kind of genetic lottery, are destined to live forever. This next passage may sound famililar: “They were not only opinionative, peevish, covetous, morose, vain, talkative, but incapable of friendship and dead to all natural affection, which never descended below their grandchildren. Envy and impotent desires are their prevailing passions.” Worse yet, “They have no remembrance of anything, but what they learned and observed in their youth and middle age, and even that is very imperfect [my italics]. And so ended the career of the most influential satirist in the English language.